‘I was okay to walk the ramp without the glares but everyone who saw my eye got scared. So I thought it best to wear the ‘chashmas’,’ Salman posted on his Twitter page. He explained the reason behind the bruised eye. ‘Of course it hurts and vision is slightly blurred, but will be fine in a few days,’ he added. Salman walked the couture week ramp with Bollywood beauties like Priety Zinta, Katrina Kaif, Rani Mukerji, Bipasha Basu, Karishma Kapoor, Sushmita Sen, Priyanka Chopra, Kareena Kapoor. He says he loved scaring them all with his bruised eye. And it’s for this reason that the actor is sporting dark glares at all public events. 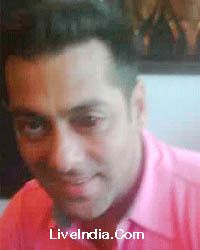 So for all you guys wondering why Salman is wearing dark shades even indoors, this revelation sure solves the mystery. Grapevine has it that the controversy stricken Khan was in Dubai recently to get the surgery done. Which is why he was sporting his sun-glasses on ‘Bigg Boss 4’ and even at the launch of his ‘Being Human’ signature watches at the HDIL Couture Week. Now that this Khan is over 40 and is still the most eligible bachelor in the Tinsel Town, he seems to be quite desperate to maintain his youth. After all, the most gorgeous women of the B-Town have wooed him for his looks.